To coincide with commemorations of the 100th anniversary of the Armistice, The National Library of Wales (NLW) has published on its website The Cardiganshire Great War Appeals Tribunals Records. Members of the local tribunals were not trained and their decisions were highly inconsistent; therefore, county tribunals were set up to adjudicate in cases where men were appealing against the decision of the local tribunals. In 1921, the Government ordered that all county tribunal records should be destroyed; nevertheless the Cardiganshire records survived and were deposited at the NLW in 1924 by George Eyre Evans and Sgt. Major Thomas Richard Fear (founder of the ‘Aberystwyth Comforts for Fighters Fund’). Now the archive is completely unique in Wales, and one of the few of its kind that exists in the United Kingdom. Completing the Application for Exemption forms, that were presented in English, would in itself have posed a significant challenge to the mainly monolingual applicants, who would often have to rely on their employer or an educated member of the community to apply on their behalf. 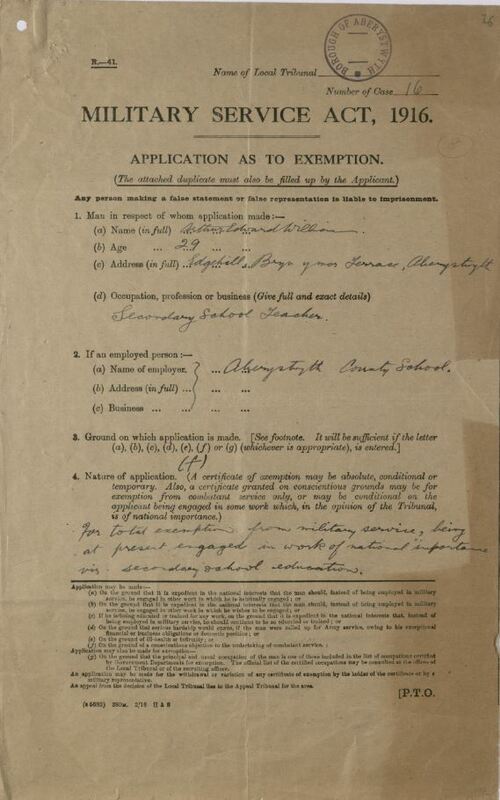 The information within the Tribunals Records offers an insight to the personal circumstances of those applying for exemption, as well as the impact of conscription on rural communities. However, Llewelyn Bankes Price, the Military Representative for the area, contests this decision stating “that no serious hardship would ensue if this man were called up for Army service”. 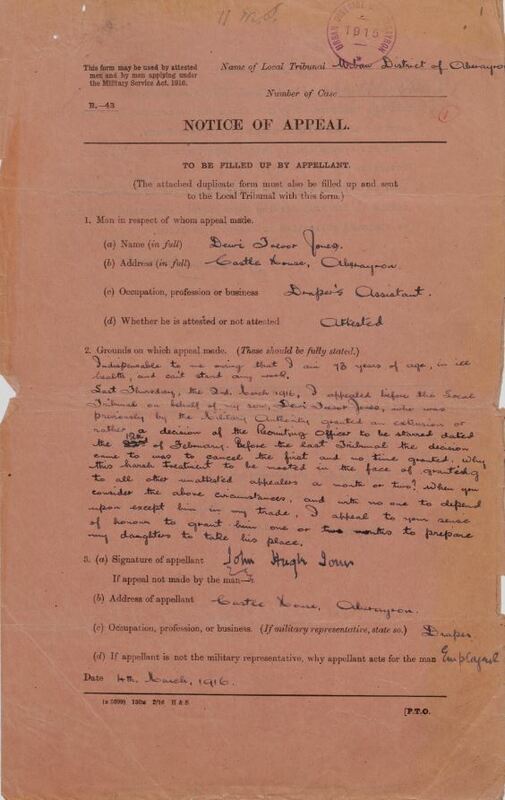 As with the majority of appeals, the county tribunal adjudicates in May 1916 – “that the man be not exempted”. Thomas Davies Evans leaves his home town of Lampeter to serve in the Royal Engineers; sadly, he will never return. His fate can be traced by referencing the Welsh National Book of Remembrance, which was recently transcribed and indexed as part of the ‘Wales For Peace’ programme. The Cardiganshire Great War Appeals Tribunals Records were digitised and made available to the public through an online crowdsourcing resource recently developed by the NLW, while financial support from the Heritage Lottery Fund enabled NLW staff to visit community groups to train their members in how to use the online resource to transcribe and index the records. Thanks to the dedication of over 200 volunteers, the collection can now be searched by name, address, date, etc.